I've been craving chocolate so much recently. I even made two chocolate cakes this week (the first one was the chocolate cheesecake). At first, I wanted to make a flourless cake (sounds healthier + I have made one before and it was divine), but finally I decided that I want a rich, buttery, deep dark chocolate cake. And I don't regret my decision. At all. Once you bake it, I suggest trying it at room temperature first (when the frosting is still creamy and soft). But in my opinion, it's so much better chilled. Leave it in the fridge overnight and you won't believe how incredibly fudgy it becomes after a night in the fridge. 1) Preheat oven to 180C / 350F. Prepare a 20x20cm / 8x8 inch silicone (or greased metal) baking pan. 2) In a small bowl, combine together cocoa powder, flour, baking powder and salt. Set aside. 3) In a large bowl, beat butter and sugar until light and fluffy. Add eggs and beat until well combined. Add vanilla extract. 4) Mix in one third of the flour mixture, then add half of the sour cream and repeat the process (total - 3 additions; finish with flour). 5) Bake for 25- 30 minutes. Cool completely. 6) To make the frosting, beat all the ingredients until soft and fluffy. The longer you beat, the fluffier frosting you'll have. Don't be lazy. Your butter measurements both say 3/4 cup but have different grams listed. I hope the grams are right, that's what I went with, can't wait for it to get out of the oven. Sorry, I wrote the wrong measurement for cups. The grams are correct. Hope it turned out great! Oh my gosh!!! This look INCREDIBLE. No one ever regrets anything having to do with chocolate. ;) Pinned! I totally agree! Thank you!! I would like to print this recipe however their are no icons and/or instructions. Please advise. Thanks. You can copy and paste the text you want to print to Microsoft Word and then print it. Hope this helps! Can you please clarify the measurements in cup size that are incorrect. I believe all measurements are correct. I haven't written the equivalent for sour cream only: 35 grams equal approximately 2 tablespoons of sour cream. Hope this helps. What are the correct butter measurements for both the frosting and the cake? All the written measurements are correct. For the frosting, you will need 84 grams of butter which equals 3 ounces or 3/4 of a stick. I made this cake today and it was HORRIBLE!!!! Don't waste your time. I question whether or not the measurements for the cocoa are incorrect. I've compared other recipes for a ratio of flour to cocoa and none have any where near this amount. There are other recipes out there that would have a better result. Sorry! 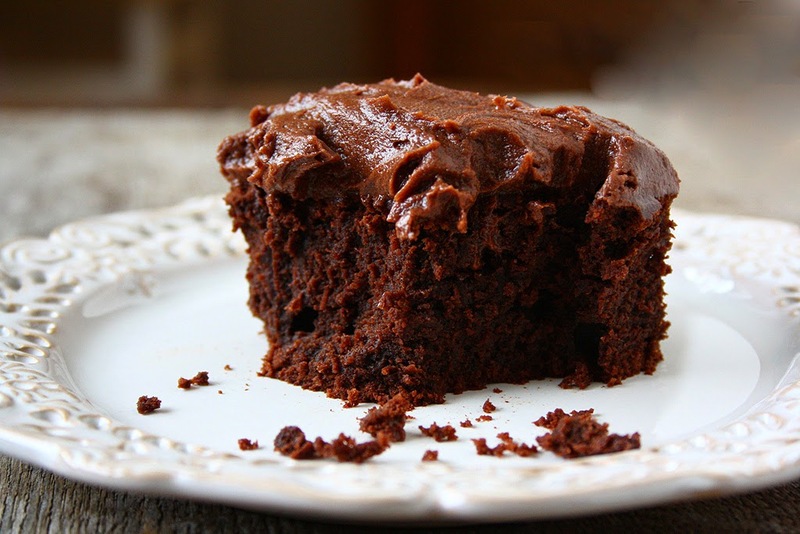 I must agree with you - this isn't the best chocolate cake but the frosting is amazing. Thanks! I should have read this first. It really ticks me off that the butter (cup measurement) was wrong. Get your grams and cups right or don't print the recipe. I probably now have a disaster in the oven. Ticked off!! I just made the cake and am glancing at the comments after putting it in the oven. If you know the recipe is wrong, why would you not edit it to correct it. Frustrating. I wish I had read this first - I looked up the equivalent to 35 grams, and it said between 1/4 and 1/3 cups! VERY different than 2 tablespoons. DONT POST ANY MORE RECIPES!!!!!!!!! THIS RECIPE IS A DISASTER!!!!! Made this cake today without reading the comments, so I followed the measurements posted. My husband hated the dense texture. I didn't think it was horrible, but I won't make it again. I agree with other's comments, if you know the measurements are wrong you should correct them immediately.